This is becoming a bad habit, but I once again found myself looking at a new kayak. I wrote a little more about that a year ago, including a list of possible alternatives for me and I'm not going to repeat all that. After that pondering I returned the cracked Zegul Arrow Play to the shop and bought a new kayak, a Seabird Scott MV HDPE, which I still think was a good buy. I wrote a little about it here. The plastic Seabird Scott, however good it is, is still not really enough to be my number one performance kayak. For that I really want a composite kayak. I also sold the Aquarius Sea Lion last spring, even though it fullfilled most of my requirements. The main thing not good enough was the cockpit opening, which was too short for my long legs. In the beginning of the summer I got the Venture Capella 173, as a replacement for the Arrow Play. 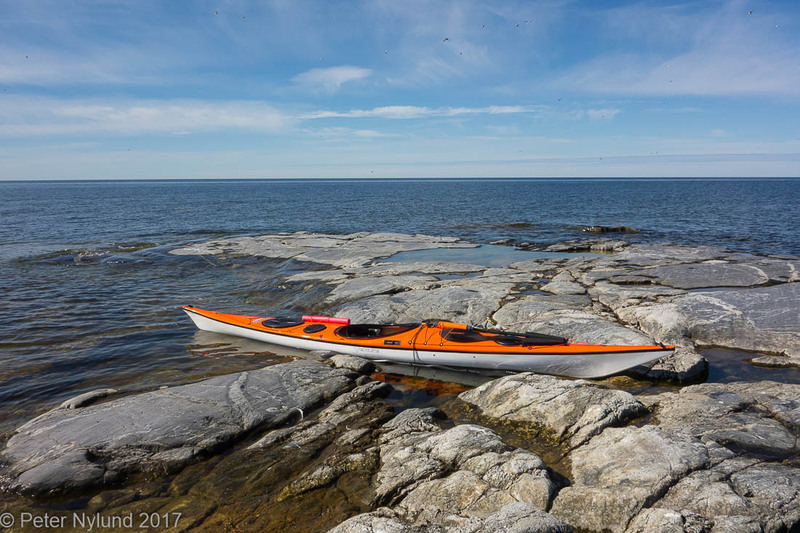 The Capella 173 was actually in most aspect a very good kayak: It was fast, stable, roomy, manouverable and good in hard conditions. I've written a little about it here. It is now sold, since despite all its good sides I couldn't get the seating position I wanted in it. And thus I once again was looking for kayaks. Just to recall the problem, I'm quite tall at 192 cm with long legs. I'm also somewhat heavy at a little above 100 kg, with a few kilos extra, but that is less of a problem. My main problem is to get a long enough cockpit to be able to get my legs in after having a least partly seated down in the kayak. Most of the better performance oriented Brit kayaks (I'm schooled in the British kayak tradition) fail this requirement. I'm not willing to give up this requirement, since that means giving up a number of opportunities like rodeo self rescues, working ladder rescues and reasonable surf launches and landings. There are big kayaks, but I don't want a freight ship. 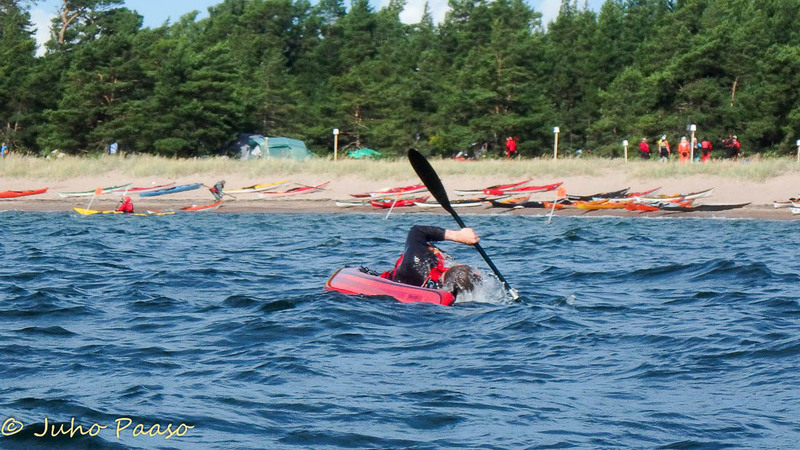 I've seen enough people in too big kayaks having real problems when the wind increases to want to avoid that. The Tiderace cockpit is just too short. 1-2 cm longer and it would be fine, but now it's not good enough. It could possibly be modified, but I'm not really willing to start modifying a kayak that is really expensive. The Zegul Arrow Bara seemed to be an excellent kayak, but ultimately I didn't have any reason to trust the Zegul quality. Last year's experience left a bad taste and several sources confirmed my impression. One manufacturer that interested me was Skim Kayaks. Several friends have Skim kayaks and they look very good. Nobody had the model I was interested in, though, and it took a while get an opportunity to test the Skim Beaufort. I did manage a short test during the guide course a two weeks ago, but wasn't overwhelmed. 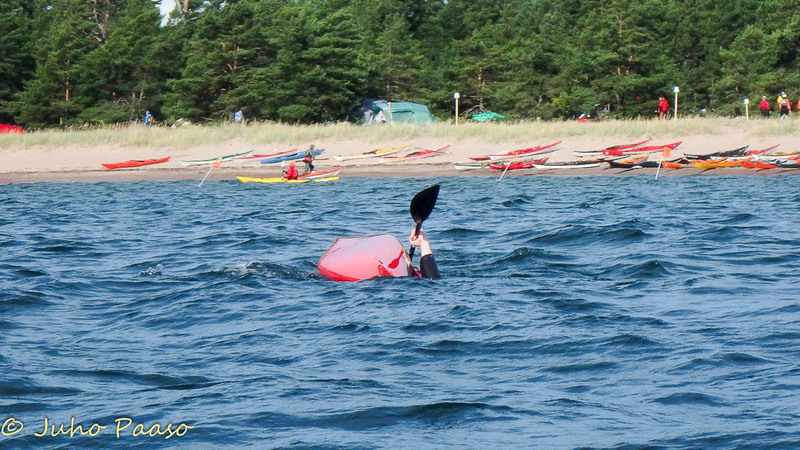 Juho Paaso had his kayak customized and my legs didn't really fit good enough behind the moved back front bulkhead. 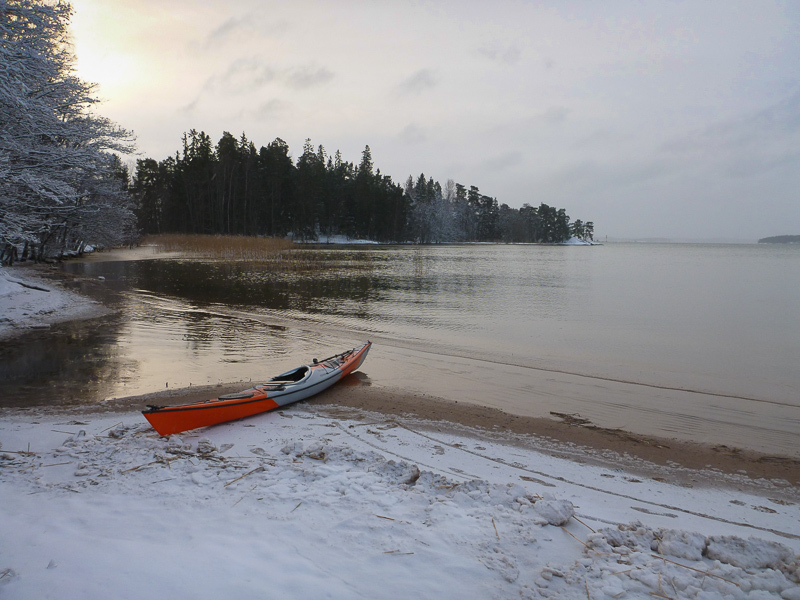 Picture by Petri Lindström. 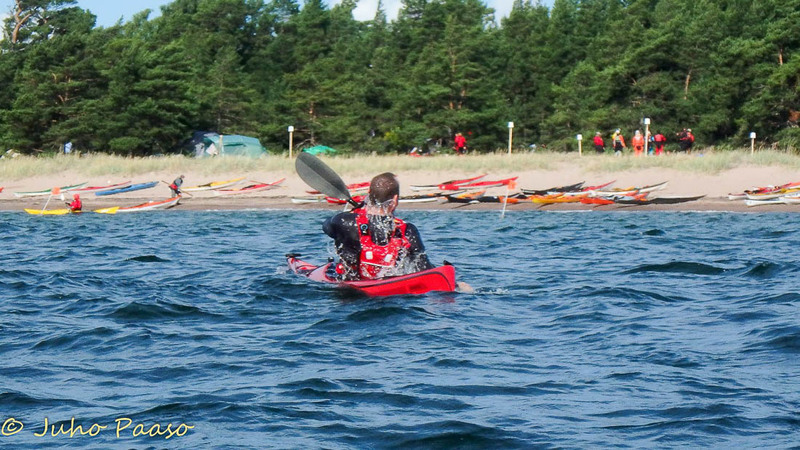 I realized that the short test paddle I had done was not enough to get an impression of the Skim Beaufort, so when other circumstances took me close to Hanko on last Sunday, the final day of this years Hanko Sea Kayak Gathering, which I otherwise didn't have time to attend, I took some time to visit Skim's stand there. I tested the Beaufort a little better, checking out things like speed, directional stability, rollability, stability and turnability. Juho Paaso took a few pictures. The Skim Beaufort turned out to be easy to roll. On the first attempt I didn't know this and used enough power to have me almost capsize on the other side. The roll below seems to show a test with a bit too little power, indicated by the paddle going to far back and sinking too much. The hull has a slight V bottom, probably moderate V by today's terminology, since shallow V seems to mean flat bottom nowadays. By default the Beaufort cockpit opening was too short, but I had a discussion with the designer, Evert Aartsen, and we came up with a way to modify it to be long enough. Less that a week later I put in an order for it, with a modified cockpit and some other small modifications. I'll go to the factory in October to fetch it. 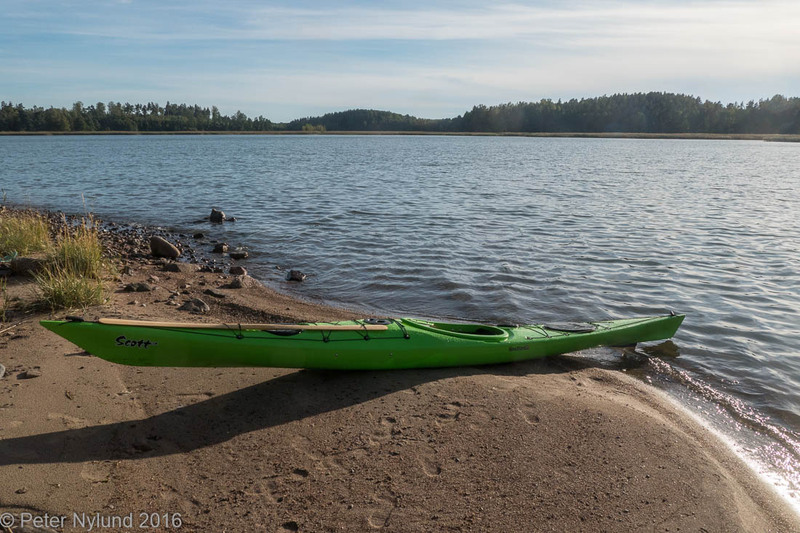 I'm quite excited about this kayak and there definitely is an added value in being able to talk directly to the manufacturer, which resides in Kokkola in Finland. Fortunately I'm quite busy in the nearest future, otherwise the wait would be long.